This is the record, extracted from my journal, of a trip to the Austrian Alps, first with Ben and later with Roy and Donald. On my last trip to this area, I had gazed up at the peaks and glaciers far above the huts, and wished I could experience that zone, almost another world. After doing some research, I decided that we could not possibly do the trip safely by ourselves, so I hired a guide for a few days to climb with us up high. This made the trip different from anything I have ever done before. But first, I have to start at the beginning. I arrived in Frankfurt at 9AM, after a little sleep on the plane. I had to change terminals, and got stuck for an hour on a malfunctioning tram. When I arrived at the right terminal, there were 100 terminals but none assigned to any particular flight, so our rendezvous plans were defeated. I had to re-check my bags, so I got in a huge line. After a while Ben showed up with his bag. We eventually checked our baggage, and had time to go into Frankfurt for a couple of hours, to see the old town square, the river, and some of the downtown area. When we got to Innsbruck and checked into the hotel, we want for a walk around town. We strolled around a bit, and had traditional Tyrolean fare in a sidewalk restaurant. We took an early train to Hochzirl, along with a couple other hiking groups. The trail was steep but beautiful. We stopped half way and had lunch and a cool drink by a spring. We reached the hut in the standard time: 3 hours. In the afternoon we climbed part way up Grosser Solstein, and then climbed a little way up the opposite side, where there was a big flock of sheep watched over by a sheep dog. The sheep were very friendly, and each one had a remarkably distinct baa. Solsteinhaus was pretty full, but not crowded. Our room had another group in it, but there were still had several empty beds. Every other party seemed to have young children, but the hut was very quiet at night. Looking through the guest book, I located by entry from two years previous. I could only find a single other party from the US in the intervening time. We had a big breakfast and headed out early. The trail descends steeply for an hour, then starts climbing steeply for another hour. We passed more sheep and also a herd of cattle, who were also interested in us. They wanted to lick us. The trail then headed steeply down. It is a frustrating trail if you want to make progress. 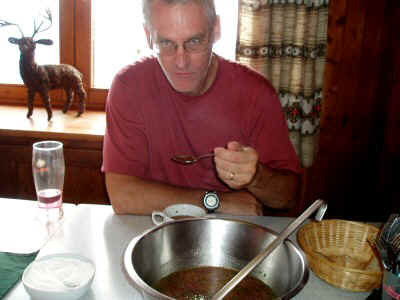 Finally, it headed steeply up into the Frau Hitt bowl. The last part of the climb was grueling, but eventually we reached the saddle. The saddle has cliffs on both sides, so it feels very exposed. We saw hikers coming from the lift station on both the trail and also on the ridge (klettersteig) route. We continued on to the station, hiking in the rain the last 10 minutes. We were too close to stop and put on rain gear, but by the time we got there, we were pretty wet and cold. When we got back down to Innsbruck it was much warmer. We met Roy and Donald at the hotel. We took another walk around Innsbruck, had another meal at the same restaurant, and went home for a good night's sleep. We said goodbye to Ben, then waited for the guide to arrive. The guide, Martin, is about our age, and has been a guide for 30 years. We checked over all the equipment, loaded up, and drive to the end of the Stubai road. The gondola ride was very impressive -- three stages and 2000 meters up. At the top we traded our short sleeves for our jackets. There was a climbing route near the hut where we climbed some 20-30 foot walls, roped together. Everyone seemed to do well. Once we got to the top, we learned a new word: berghurrah. The hut is charmingly old -- built in the 1800s -- and has an uncrowded, warm feel to it. Roy, Donald, and I are in a small room by ourselves. We all enjoyed a four-course dinner featuring wiener schnitzel. I got up at 6:00 AM, saw that it was raining lightly, and went back to bed. We are not going to the peak if the weather is bad. At 8:00 it was snowing, and we are definitely staying put. Most of the people here are going down, or back to the lift. By 11:00 the weather has cleared, but it is too late to go for the peak, so we head over to the glacier for some practice. Everyone gets to practice walking in crampons, walking up and down the steep ice, chopping steps, rappelling, etc. We crossed some crevasses, crossed over the glacier, and headed back. While we were out it snowed most of the time. We made a circuit, hiking to the glacier by one route, crossing it, and hiking back by the other. We will return to the glacier tomorrow by the way back, which involved less descent and ascent, but which had one very steep traverse across the top of a very high cliff. There was a cable to hang on to, because the drop was about 1000 feet. By the time we got back to the vicinity of the hut, the sky had cleared again. Each of us took a short turn wading in the lake, which was very cold. I stepped wrong on a rock, and fell into the water, to everyone's amusement. While we had been gone, the hut had filled with new parties, including a group of 20 on a one-week hike across the alps. Another party consisted of a guide, parents, and three extremely cute little girls, 9, 12, and 15. We heard they were also planning to climb Zuckerhutl the next day. Martin and I discussed our options, and although it would be most desirable to descend to Sulzenau or Nurnberger, that will not be possible so we will descend to Dresdner and go on from there. That puts us three days behind, but that's life. This is our big peak day. During the night I was tired, sore, and my blister hurt. I decided I would not be able to go for the peak, and would go back to the lift and meet everyone at Dresdner hut. This decision made, I got a good night's rest. But by the morning I felt more optimistic -- the weather was clear but colder, and the blister seemed to hurt less. Donald offered me his blister kit, and I made a moleskin patch with a hold in the middle, which seemed like it might make a difference. We were supposed to be up at 6:30, and be gone by 7. Roy and Donald slept late, and we did not leave until 8:00. We hiked back to glacier, going slowly and deliberately. Several parties passed us, including the family with the three girls. Walking up the glacier was easy, since the slope was moderate and the surface pretty even. One of the parties in front of us turned around, complaining of too many crevasses, but I did not see what they were worried about. Slowly we approached the peak, circling around it. As we climbed up the ridge, the slope got steeper and steeper until the snow stopped altogether. It is hard to get a sense of scale with pictures like these. In the previous photo, there is a party of two climbers crossing the glacier, heading toward the saddle, ahead of us, just visible as a speck. There is also another party, the family that had passed us earlier , on the ridge. I have blown up the photo above, and you can just barely see them on the ridgeline. We could see them crawling slowly up the steep slope, and it seemed impossible that we could actually climb up something that steep. But before long, we were there ourselves, climbing up and up the ridge. At the top of the snow, we took off our crampons and stashed our axes, and continued up the nearly vertical rock another few hundred feet. After one impossible-looking stretch after another, we finally reached the peak, and the cross. The view from the top was so spectacular that it is impossible to describe. We could see into Italy, we could see down the Stubai valley to Innsbruck and the Karwendel, we could see Muller Hut and Becherhaus, we could see the high peaks of the Oetzl including Wilder Freiger. The descent was just as hair raising as the ascent. We picked up our crampons, but instead of descending the ice we went down the adjacent rock. Down at the shoulder we donned crampons and headed back across the glacier. Instead of descending back to the hut, we cut over the ridge on a surprisingly good trail and hurried back down 1500 meters of steep rocks, cliffs, glacier, ski slopes, etc. By the time we got to Dresdner hut we were all pretty tired. Luckily, we got there just before they stopped serving dinner. After dinner Roy and Donald disappeared, while I spent about an hour chatting with Martin while he waited for a ride back down. My blister is no worse than yesterday, even after this grueling day, so I am confident for the rest of the trip. I have a sunburn on my neck and ears, but that's all. We are all looking forward to a light hiking day tomorrow. It would be nice to catch up by skipping Sulzenau and going all the way to Nurnberger, but that seems unlikely. There are hordes of people at breakfast, and all along the trail. Many more arrive on the lift after we start up the trail, and all of them pass us up. We adopted a slow but steady pace, which was OK since there was no particular reason to hurry. The trail did seem extraordinarily steep, with nearly vertical cliffs in many sections. Fortunately, there were cables at many places. As we approached the pass Pieljoch, we started seeing the many cairns for which it is known. There were hundreds of them, many elaborate structures six or more feet high. Roy and Donald helped maintain them. The trail descended along the canyon wall, with spectacular views the whole way down. We could see Blau Lake, where Roy later went for a swim. We passed the Klettersteig, where there were several groups of climbers on the wall. Finally we reached Sulzenau after 6 hours (the route was listed as 3). Luckily there were still a few places left in the lager -- we got some of the last places there. Roy and Donald disappeared, but I washed my socks, relaxed on the patio, observed workmen building new foundations for the lift (and riding back down at the end of the day), and generally being lazy. Many people headed back down the trail, but more arrived from high above on the glaciers. At dinner time approached, Roy and Donald were still missing, but I claimed one of the last tables. I shared it with some other hikers, but saved space for Roy and Donald, who showed up by and by. We had a wonderful time talking with our table mates, who were from Germany. Two of them were traveling together, with another who they had met on the trail. We stayed and talked until lights out at 10:00. Fortunately I had set my stuff out and was able to get into bed in the dark. In the morning we could see who else was in our sleeping room, and were surprised to find at least a half dozen children, including toddlers. They had all been so quiet all night long, I would never have guessed. We had breakfast with our new friends from the night before. I learned from them that tomorrow's weather is predicted to be rainy and cold. 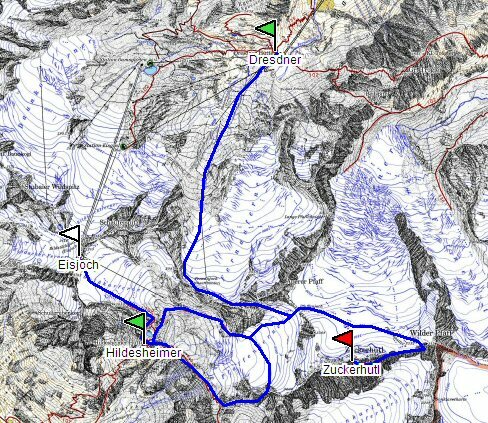 Although I would like to make it to Dresdner hut today, Roy and Donald are moving slowly, and with the weather it looks like we might not make it. The morning is beautiful, and the trail passes through some spectacular meadows and past some beautiful lakes. Then the trail heads straight up the usual set of cliffs. Again, these are protected by cables. When we finally reach the top, the view is again magnificent. As we relaxed on the pass, we saw a helicopter fly up and down the canyon a few times, pass overhead, and disappear towards Sulzenau hut. From the pass we could see the Sulzenau hut far across the valley, and also Nurnberger hut, almost directly below us. All we could see was the roof, but it looked so close. In reality, it took an hour to make our way down to it. We got to the hut about 2:30 and got situated in a small lager room with 7 places. Soon it began to thunder, then hail, then it settled into a steady rain. The temperature dropped 20 degrees. Everyone rushed inside. We had an afternoon snack -- I had kaiserschmarn, Roy had a spectacular plate of meat and cheese. The food here is the best. Since tomorrow is predicted to be wet, we will stay put tomorrow and descend from here the next day. The clouds have enveloped everything, and we cannot even see the lift building ten feet away. We were joined at the dinner table again by yesterday's friends Hans and Bernard. In addition, we were joined by a younger couple (in their 20s) from Liepzig. They just walked up today, and plan to go around to Innsbrucker. Hans and Bernard are going down tomorrow. I think Nurnberger hut has the best food we had eaten on this trip. Lunch of coldcuts was spectacular, but also the deserts were exceptional. It was raining when I woke up. Only the dining room was warm. Rain is predicted all day today. I spent the morning watching the people. I see several parties each day traveling with dogs. One had been on the glacier, and had on a climbing harness and was clipped into the rope. Mostly I see medium sized dogs, very well behaved. No yappy toy breeds. People here all seem to come prepared with very serious gear -- full rain gear, heavy boots, parkas, and gloves, huge packs stuffed full. We shared our room with a pair of hikers who had each filled their 70 liter packs -- with clothes, not even climbing gear. This afternoon I went for a hike up the valley to the lake. Roy and Donald were nowhere to be found, so I headed up by myself. It was raining lightly, and everything was wrapped in clouds, but the trail was pleasant and the valley beautiful in its eerie clouds. The waterfalls emerging from the mists, their tops invisible, were marvelous (although they did not photograph well). Back at the hut, everything is warm and convivial, with people playing board games, visiting, coming and going. The hut is even more packed tonight than yesterday, and we find two additional blankets and pillows have been squeezed into our room. It turns out we are sharing with a group of hikers from the Czech Republic -- apparently a family of six. We all squeezed tight and I fell asleep quickly after the giggling and whispering stopped. Seven of us squeezed in to a space about six feet wide. The parents had there own corner of the room. The weather today is beautiful -- blue sky and puffy white clouds. The walk down to the trailhead was a leisurely 2 1/2 hours. At first we switchbacked steeply down, but then we got down to the valley floor where it was green and moist. It was pleasant walking through lush forest and grassy meadows, rather than rock and ice. We passed many new kinds of plants and especially flowers, which we had not seen all week. Waiting for the bus at the trailhead, we see the large group of kids that was at the hut arrive. They were apparently some kind of summer camp, just returning to their parents. Returning to Innsbruck, we were surprised by how much warmer it was. We said goodbye to Donald, got cleaned up, and went to bed early in anticipation of a very long day tomorrow. The flight home was long and arduous, but trouble free. Met Donald on the plane, he rode home with us. hot chocolate packets for breakfast?